The scandals and mysteries of the Vatican Bank may well have been behind the Pope's decision to resign. The new Pope who is currently being chosen will face considerable pressure to reform and offer greater transparency in both the Church's financial and ethical dealings. On February 11, 2013, Pope Benedict XVI stunned the world by announcing he would step down on February 28. It happened, appropriately, during a Cardinals’ convention where the Pope made a speech in Latin (an Italian journalist proficient in the ancient language was the first to understand the meaning of the Pope’s words and rushed to give the news, but she had to make some phone calls first to check that she had indeed understood correctly. This is the Vatican’s way of doing things: ostensibly quaint, but often deeply serious). Benedict XVI’s move was revolutionary in that he was the first Pontiff to resign – or, more correctly, to abdicate – since the Middle Ages, and he has set a precedent which will be relevant for all future Pontiffs. But why did he do it? He cited old age and his failing energy in dealing with Church affairs rather than any specific health problem. “Loving the Church also means having the courage to make difficult decisions, thinking of the Church and not of oneself,” he said (in Italian) on February 27, the day before leaving office. In the frantic weeks after the Latin announcement, the Italian press split into two: some papers devoted much time and ink exalting Ratzinger’s courage and explaining why leaving office was as brave an act as Pope John Paul II’s determination to keep working in the face of sickness and death. But, with a frankness unusual in the Italian media’s dealings with the Vatican, several journalists actually put in print that the Pope’s decision had been influenced by the scandals rocking the Roman Catholic Church, both of a moral nature (the cases of paedophilia above all) and of a financial nature relating to the IOR, the so-called ‘Vatican Bank’. 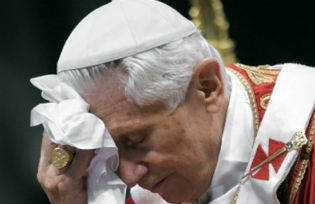 Ratzinger apparently stepped down, unable to solve the infighting in the Church (opening the way – perhaps – to a more energetic Pontiff) either because he had not managed to reform his ailing Church, or because he did not want to face the risk of further embarrassing disclosures. And here I beg the reader’s forgiveness if this article contains a good many hypotheses. Vatican affairs are often shrouded in mystery and Vatican influence is such that the Italian media tend to tread delicately on hallowed ground. People offer opinions rather than hard facts – and when they do speak, they prefer not to be quoted at all. However, disclosures are in the air. After the Pope’s announcement, the press reported that for more than a year, a three-cardinal committee led by 82-year-old Julian Herranz had been conducting an investigation that included hundreds of interviews, producing a hefty dossier on the Vatican’s secrets, concerning both moral scandals and the IOR affair. The conversations with the cardinals, wrote the Italian daily La Repubblica, deeply troubled the Pope and were at the core of his resignation. The dossier is now safely locked away in the Pope’s safe and, as Vatican press officer Padre Federico Lombardi himself declared, there it will remain until the new Pope can read it. The issues raised by the dossier however will certainly be discussed by the conclave of cardinals who will elect the new pontiff. Their decision might be heavily influenced by the content of the dossier. If we believe what has been filtering through the media, the mysterious dossier also investigates a “gay ring” that was active in the Vatican. Meanwhile Scottish cardinal Keith O’Brien (the highest prelate in Britain, no less) asked for forgiveness and admitted having “fallen beneath the standards expected of me” following the accusations of a former priest and three current priests from the diocese of St Andrews and Edinburgh. They had complained in early February to the Pope’s representative to Britain, Archbishop Antonio Mennini, of having been forced to have sexual relations with O’Brien in the 1980s. New revelations may well crop up but the Church is trying to minimize the misdemeanours of single priests and the subsequent cover-ups by their superiors. The financial mysteries of the IOR, however, are far from solved and are potentially even more explosive than the sexual vagaries of individual priests. The so-called ‘Vatican Bank’ has been under pressure from the world of international finance to create a system of much greater transparency, in compliance with international rules against money laundering, because its loose financial practises leave ample loopholes for people who might use its accounts for unsavoury or even criminal activities. The IOR appears, however, to be stalling for time. The events of the last few years painted a picture of a tug-of-war between the Holy See and the Bank of Italy, which was concerned about the connections between the IOR and the Italian banking system. It was a struggle which the Vatican Bank apparently intended to solve by putting up a front of greater cooperation while simultaneously trying to avoid scrutiny of its past and present activities. And this is exactly what has happened over the last two years. Strictly speaking, the IOR (Istituto per le Opere Religiose) is not a bank at all – nor an investment fund exactly, nor does it act as a Central Bank for the Vatican, nor does it control the Vatican finances. It numbers up to 33,000 accounts in the name of selected clients (religious institutions, priests and people linked to the Vatican) whose identities are highly confidential. Both the Bank of Italy and the international financial community were specifically worried because the IOR never revealed the list of its clients’ names, much less of all the people who had access to the accounts in other people’s names. For instance, an account opened in the name of a priest might be operated by several different people, with no controls and no records. The official aim of the IOR is to invest clients’ money: all the profits go to good works. Some clients however enjoy up to a hefty 7-9% interest rate. Clients can deposit and take money out of their accounts, but for money transfers they need to operate through an external bank. Account No. 1 is to the “Obolo di San Pietro” (known as Peter’s Pence), the place where money from all over the world arrives for gifts directly to the Pope. The amounts – while just a drop in the ocean compared to the Vatican’s general finances – are staggering: gifts to the Obolo di San Pietro, meant of course for charitable works, amounted to 69.8 million euro in 2011. Historically, several Italian banks worked with the IOR on the Italian market in past decades: money has been going through the IOR accounts at Banco di Roma (now Unicredit), Banca Intesa, Banca Nazionale del Lavoro, Credito Artigiano and others. A couple of judicial enquiries were begun between 2007 and 2010 in Rome investigating bank accounts where transactions occurred regularly with no specific records either relating to the provenance or the destination of the money involved. The Bank of Italy became more and more worried about this, and in 2009, Bank of Italy officials advised Italian banks that they had to consider the Holy See as a foreign State that was non-compliant with international regulations on transparency. Thus every transaction since then has to be recorded, stating the purpose of the transaction and a physical person both at the origin and at the final destination of the money. Created in 1942 by Pope Pius XII, the IOR has been involved in several financial scandals in recent Italian history, in a chain of unsolved mysteries, from the Sindona affair to the collapse of Banco Ambrosiano (the bank whose major shareholder was the IOR, and whose sorry story ended with the death of banker Roberto Calvi under the Blackfriars bridge in London in June 1982). No direct involvement of Vatican officials has ever been proved or discussed in a judicial context, although there have been countless journalistic reports and fictional creations galore hinting at the role of the Vatican and even the Mafia in these affairs. On the other hand, one may argue that no banking system in the world has ever been fully compliant with official regulations, and that money laundering and other unsavoury activities has only become more difficult in the last decade because although internet banking has allowed for quicker transactions, there is now also a much greater degree of oversight and control. At the heart of the matter are the powers of the Roman “Curia”, the official bodies and authorities forming the administrative system of the Holy See and acting as a government. The Roman “Curia” is headed by the Secretary of State, the ‘Prime Minister’ in the Vatican hierarchy. The Pope names his own Secretary of State and can always dismiss him. But the Curia has shown the hostility to change and to external scrutiny typical of any long-established, elephantine bureaucracy. Thus US cardinal Theodore Edgar McCarrick, Archbishop of Washington, in Rome for the Conclave, reflected a widespread opinion when he said that reforming the Curia should be one of the priorities of the new Pope: “He should understand what is good and what has to be reformed”. And German Cardinal Walter Kasper along on the same lines: “I think the Curia in general needs to be revolutionized. And as well as the word reform, there must be a second: transparency”. It is a matter of debate in Italy how much Ratzinger was actually involved in the day-to-day management of Vatican affairs, and the prevailing opinion is that the Pontiff – after trying unsuccessfully to launch a general reform in 2007 – preferred to observe things from afar. Power in the Vatican is in the hands of his Secretary of State, Cardinal Tarcisio Bertone. 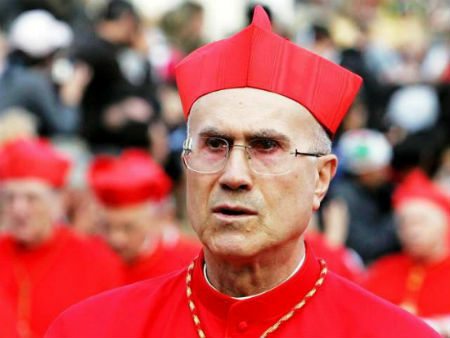 In recent years many have pressured the Pope to dismiss Bertone, who does not come from a diplomatic background and who has more than once demonstrated his inability to control the different factions in the Vatican. Ratzinger, however, always resisted such pressures and kept faithful to his old secretary in the Congregation for the Doctrine of the Faith, where they worked together from 1995 to 2005. And last summer, while the Vatican was battling a couple of its worst crises in years, Ratzinger, music lover, accomplished pianist and passionate scholar, was deep in his studies – including the polishing of the third volume of his biography of Christ, “The Childhood of Jesus”, published last November to much acclaim. The book was irreverently nicknamed by the Vatican experts “the prequel”: but, half study of the Gospels, half theological reflection, it certainly required many long hours of meditation and writing. Meanwhile, Ratzinger’s days were disturbed by the curious “Mystery of the Thieving Butler” and, more seriously, by the chaos in the leadership of the IOR. In the last three years, the Vatican has apparently made great efforts to conform to requests for transparency made to the IOR. It even asked officially for an evaluation by Moneyval, the Council of Europe organ of mutual evaluation for bank transparency purposes. One step was the appointment to the head of IOR of an experienced banker, Ettore Gotti Tedeschi, who for twenty years had been an executive at the Spanish Banco Santander. He was very close both to the Vatican and the Bank of Italy. Another step was the creation of an oversight body: the AIF (Autorità di Informazione Finanziaria, a Financial Intelligence Unit), which should have had the power to inspect IOR accounts and manage the relationships between the IOR and other banking institutions around the world, creating protocols of agreement on the transparency of transactions. Almost all of the AIF people were lawyers from the Bank of Italy, among them Francesco De Pasquale, who was appointed a Director. But the activities of this body were greatly hindered from the beginning. The Vatican passed a law on transparency which went into effect in April 2011, but a reworked version in January 2012 put several obstacles in the path of AIF activities (one change was that the signing of any protocols with foreign states had to obtain the approval of the Secretary of State). And then the roaring summer of 2012 came along: from the Butler affair to the European scrutiny of the IOR. Several people suggested to me that there was something murky in the timely explosion of the Butler Affair in late May, because it managed to obscure (in the Italian press at least) the much more momentous firing of Gotti Tedeschi, which had taken place the day before. In itself the Butler Affair is an intriguing story. Some papers were copied from Pope Benedict’s desk and came into the hands of the journalist Gianluigi Nuzzi, who wrote a book based on them (now available in English on Kindle under the title “Ratzinger Was Afraid”). The leaked papers revealed the extent of infighting and serious accusations inside the Holy See, describing scandals of various types: including administrative irregularities and dubious tender contracts. A whole chapter is devoted to letters written to the Pope by various prelates criticizing Secretary of State Bertone and his presumed arrogance and inefficiency. On May 24, 2012, the name of the thief was revealed and the self-confessed culprit arrested: it was – you guessed it – the butler, Paolo Gabriele, the Pope’s chamber valet. The Italian newspapers fell happily on this B-rate plot, cutely renamed “Vatileaks”, and fed on it for weeks (also later following the butler’s trial, his anguished promises that he thought he was acting in the Church’s best interest, the Pope’s forgiveness and the sentencing to 18 months). It was all somewhat grotesque, but the story certainly weighed heavily on Ratzinger, as well exposing an alarming lack of control over the people closest to the Pope. The really interesting thing, however, is that the affair came to light 24 hours later the brutal firing of Gotti Tedeschi, who had been at the head of IOR for just two years. The dismissal was signed by Secretary of State Tarcisio Bertone but had been prompted by the lay members of the IOR board, especially by American Carl Andersen and German Hermann Schmitz from Deutsche Bank, who accused the Italian banker of gross incompetency. The lay board, composed of bankers close to the Holy See, is the executive arm of IOR (IOR also has a Commissione Cardinalizia, an oversight committee of five cardinals to whom the President answers). The firing of Gotti Tedeschi appears to be one of the key points in the tug-of-war between the Vatican City and the Bank of Italy. The butler story ensured that Gotti Tedeschi’s dismissal was largely ignored by the press, but the ruthless manner of the banker’s firing leads one to think today that his main fault was to insist – however ineffectually – on greater transparency, and that the Roman Curia had yet to decide how to answer requests to investigate the internal affairs of the IOR, and in particular its accounts. This inclination towards secrecy may be motivated by an unwillingness to change a deeply-rooted habit for reserve rather than by the necessity to hide unsavoury transactions: but the material results are much the same. In recent months even the Italian press has been using with increasing frequency – albeit with great care – powerful language such as “money laundering” and “trafficking”, because the IOR’s loose regulations and its lack of compliance leave the field open to doubt. Pressure is coming also from the international financial community and several Italian judges, above all from the Procura (Public Prosecutor’s Office) in Rome. The Procura – among other cases – has been investigating a priest whose IOR account was used for money laundering. The affair involves an Italian petty criminal seeking to launder money from the theft of a Ferrari, but the sum – about 150,000 euro – is minimal. However, the prosecutors were interested in the details of the transaction as an example of the ease that the lack of control over the IOR accounts could offer to criminal activities (the money was transferred from a freshly opened account in a Barclays Bank to an IOR account in Unicredit in the priest’s name as a contribution to the restoration of a convent, which according to the Procura never took place). It is also the only case for which the Roman judges managed to obtain the financial transaction details]. The Vatican city is a foreign state in Italy: requests for information must be made via an an official international judicial request, but the Holy See has consistently refused to answer any of these Italian requests. In this climate, Vatican officials waited with anxiety last July for the first report compiled by the Moneyval experts. The Council of Europe body offered a paper which “passed” the Holy See banking finances on 9 out of 16 recommendations, mostly on the basis of the new law on transparency. The Italian press hailed the report as positive proof that the IOR was on the straight and narrow. Unfortunately, the report also failed the IOR on 7 counts, almost all related to the difficulties that AIF had found in operating, executing random checks or accessing accounts. The AIF in fact had not even been able to see the IOR accounts, nor a list of the accounts’ holders, much less a list of the people that had access to the accounts opened in other people’s names. Moreover, Moneyval wrote the report on the basis of the new regulations on transparency issued by the Holy See, but it did not verify whether those new rules had been applied. The final report was probably softened following the diplomatic intervention of young Monsignor Ettore Balestrero, one of Tarcisio Bertone’s closest collaborators in the Secretariat. From September 2012 till February 2013, while the press kept asking when a successor to Gotti Tedeschi would finally be appointed and who he would be, events took on a frantic, if covert, pace. The Secretary of State played another trump card, calling in as a consultant Swiss lawyer René Bruelhart, the 40-year-old former director of the Lichtenstein Financial Intelligence Unit, considered an expert on anti-laundering legislation. In November, Bruelhart was appointed to head the AIF, replacing Francesco De Pasquale. Thus, there were no more men linked to the Bank of Italy directly involved in the management of IOR; Bruelhart responded only to the Secretary of State. A tinge of the bizarre was added to this financial intrigue when on January 1, 2013 it emerged that payments inside the Vatican City could no longer be made by electronic cards. Buyers in the Holy See normally include tourists (visiting the Sistine Chapel and the Vatican museums) and Italian citizens shopping in the well-stocked Vatican pharmacy (anybody can enter with a medical prescription) or having the necessary pass to enter the very well-stocked Vatican emporium (great deals on linen and cashmere). Deutsche Bank Italy had been managing the ATM system for the Vatican and had to ask for special authorizations from the Bank of Italy. As the Bank of Italy considers the Vatican City a foreign State that is non-compliant with the international legislation on financial transparency, these authorizations were publicly refused and the ATM system was consequently blocked. The electronic payments story made a lot of noise in the press. It was embarrassingly public and it represented a not insignificant loss of money. Then the shock announcement of Pope Benedict XVI’s resignation shattered the layer of peace covering the turmoil of the Vatican. After ten months of dithering, it suddenly appeared imperative to find a replacement for Gotti Tedeschi: the appointment was made on February 15. The chosen banker, Ernst von Freyburg, is a German and a member of the Order of the Knights of Malta. In the same period, the Vatican press officer announced that the Vatican ATM system would be managed in the future by Swiss company Aduno Sas. 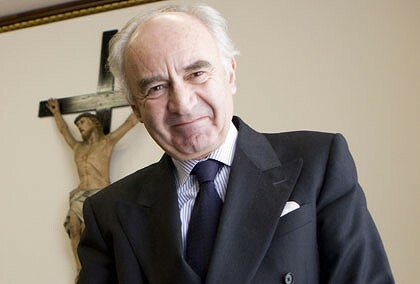 The IOR “commissione cardinalizia” also underwent changes: two of the five cardinals had to leave their positions and, unsurprisingly, they were the most proficient in financial matters and the most vocal in advocating transparency, Attilio Nicora and Jean Luis Tauran. In short, a lot of unfinished business was taken care of in the space of a few days. As a matter of fact, rumour has it that Ratzinger meant to start the period of “sede vacante”, during which no appointments can be made, immediately after his announcement that he would step down; but he was persuaded to stay on until February 28. The appointment of von Freyburg – which had of course to be signed by the Pontiff himself – is another demonstration of Ratzinger’s unwillingness to directly antagonize his Secretary of State. It remains to be seen which way the IOR will go in the future. A new Pope will probably name a new Secretary of State and he could of course revoke any appointments made by his predecessor at the head of any Vatican organ, including the IOR and the financial control unit the AIF. Next summer, the Moneyval plenary session will again discuss the IOR’s moves towards transparency. This time there will be no prior experts’ investigation. It will in any case be a gauge of the IOR’s position. Much may depend on the new Pope’s decisions. But there are indications that the Conclave will see yet more infighting between the “reformist” and “counter-reformist” factions. Possibly a new energetic Pope might have to concede the post of Secretary of State to the Counter-reformists. The solution – whatever it is – will impact on IOR affairs, and of course it will have enormous influence on the many hot topics debated in the Roman Catholic Church – from the vocational crisis to AIDS prevention, contraception and divorce, to priests’ marriages and women priests – a whole panoply of themes widely analysed in the rest of the Christian world. On December 12th – two months before his shock announcement – Benedict XVI had sent his first tweet on the @pontifex Twitter account: “Dear friends, I am pleased to get in touch with you through Twitter. Thank you for your generous response. I bless all of you from my heart”. The whole thing was conducted in a public ceremony (“And now, the Holy Father will send his first tweet” – plop went the papal finger), and the aid of a tablet. The Italian press, apparently impervious to humour, on that occasion praised the ageing Pope for his openness to the new world. The following day, Ratzinger declared that abortion and gay marriages destroy world peace. (Yes, he said they destroy world peace. Abortion is legal in Italy, gay marriages aren’t – but excite much debate). Will a new Pope change the course of the Roman Church? Will he be from Africa or Latin America? Modern times are arriving – but they still haven’t quite found their way to the Vatican’s corridors of power. Alessandra Quattrocchi is an Italian journalist working for a press agency in Rome. She writes on international politics, cultural affairs and Italy. She spent several years working for a European TV station in France and is an expert amateur on English literature and Gender studies.